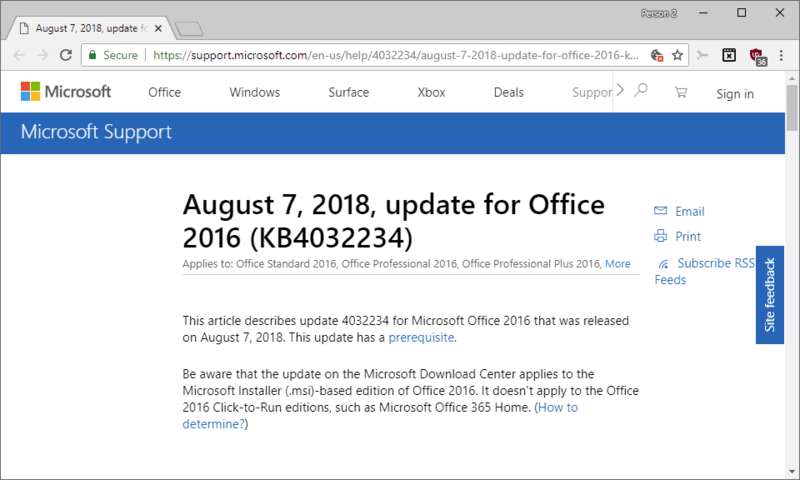 Microsoft released non-security updates for Microsoft Office 2013 and Microsoft Office 2016 on August 7, 2018. The non-security releases for Office follow a monthly schedule; Microsoft publishes the updates on the first Tuesday of the month and follows up on that with security related updates for Office, Windows, and other Microsoft products on the second Tuesday of the month (Update Tuesday). You can check out our overview of the July 2018 non-security updates for Microsoft Office here. Note that the updates are only for the MSI-based installer versions of Microsoft Office and not for Office 365. Microsoft released non-security updates for Office 2013 and 2016 only in August. KB3172506 -- Update for Microsoft Office 2013 that fixes an update issue for new meeting locations when using the Rooms button or the Room Finder add-in. KB4011155 -- Update for Microsoft Office that installs the MT Extra font to enable support for math equations created with the Microsoft Equation Editor 3.0 which is no longer supported. Also updates the Segeo UI emoji font. KB4022212 -- Same as KB4011155. KB4022226 -- Update for OneDrive for Business. OneDrive is capable of taking over relationships from OneDrive for Business. Also adds options to migrate synchronization from Groove.exe (OneDrive for Business) to OneDrive silently and automatically. KB4018374 -- Update for Microsoft PowerPoint 2013 adds capabilities to embed and play Vimeo videos and LinkedIn SlideShare, and YouTube's old embed code. KB4032250 -- Skype for Business 2015 (Lync 2013) update. KB4032234 -- The update for Office 2016 fixes two chart related issues. The first fixes a chart related crash, the second a display issue where gridlines at the bottom are not displayed. KB4032232 -- Updates the Office 2016 Language Interface Pack. KB4022216 -- Update for OneNote 2016 that prevents distributed pages in a class notebook from being deleted by students and adds a confirmation dialog when teachers attempt to delete distributed pages. 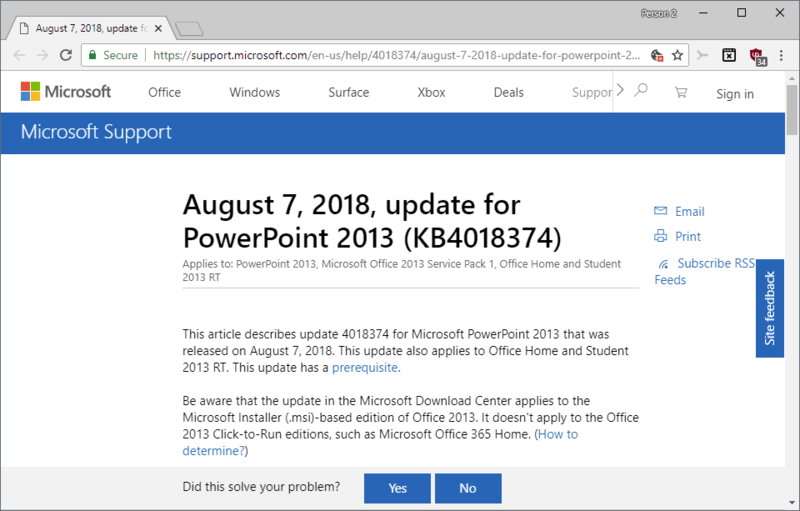 KB4018368 -- Update for PowerPoint 2016 that is identical to KB4018374. KB4032238 -- Update for Project 2016 that corrects a data loss issue when changing a local custom field's lookup table, save it, and close and reopen the project. Fixes a "garbled characters" issue in the Korean language version when using Send Email Message in Finish & Merge. Header or footer missing issue when printing documents in Word 2016 with field codes to set header or footer. Page display issue in multipage table documents in Word with Repeat as header row at the top of each page selected. Fixed a hang in Word 2016 when opening Word 2010 documents. Fixed a hang in Outlook when opening an email message with thousands of hyperlinks and scrolling the document or clicking in the message body. Fixed a crash in Word 2016 when opening specific documents in Excel and editing them in Word. Fixed an align issue for numbers when using decimal tab to align numbers in tables. Dictated text is removed when you hit backspace after using auto-correct to fix a word before the dictated word. Some text in tables was not displayed when opening Word 2010 documents with tables in Word 2016. Fixed a wrong header and footer display issue on pages with an endnote continuation. Extra paragraph was added when inserting a document by Range.insertFileFromBase64. KB4032255 -- Update for Skype for Business 2016. KB4022219 -- Update for OneDrive for Business for Office 2016 that is identical to KB4022226. I accidentally deleted Microsoft office 2010 and cant get to work on my excel files anymore. How does one “accidentally delete” Microsoft office?